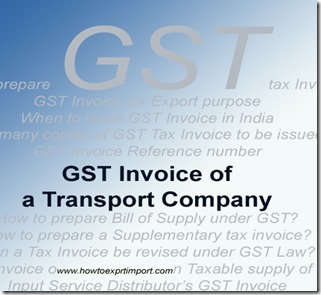 How to prepare a GST Tax Invoice by a Transport Company? What are the contents of Tax Invoice of Transport Company? Where the supplier of taxable service is a goods transport agency supplying services in relation to transportation of goods by road in a goods carriage, the said supplier shall issue a tax invoice or any other document in lieu thereof, by whatever name called, containing the gross weight of the consignment, name of the consignor and the consignee, registration number of goods carriage in which the goods are transported, details of goods transported, details of place of origin and destination, GSTIN of the person liable for paying tax whether as consignor, consignee or goods transport agency, and also contains other information as prescribed under rule 1. 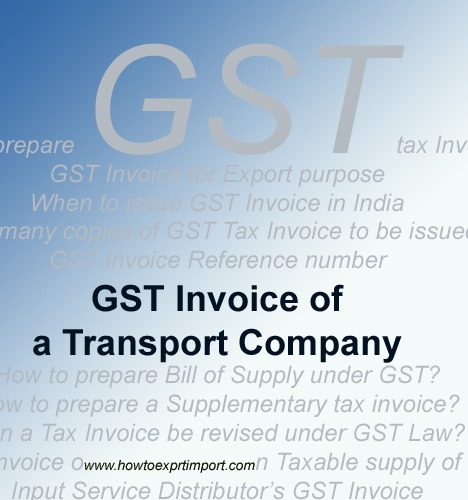 The above posts explain about guidelines to prepare GST Tax Invoice by a Transport Company. Share below your comments about tips on how to prepare GST Tax invoice by a Transporter. What are the contents of Bill of Supply under GST? Rajesh Kumar gupta: On 08 July 2017 Sir,As a transporter transporting Iron & steel from one state to other by own vehicles wants to know that is it mandatory to take GST registration. If yes than what is the Process of generating bills to our parties and who is liable to pay the GST .